to see what we can do for your car. Paint Scratch Repairs – Superficial/Shallow. This kind of damage is usually easy to fix with some careful (expert) sandpapering, followed by polishing treatments. Common causes include home-detailing with a dirty/sandy chamois, bush-bashing, children (!) and overuse of drive-through car wash. Paint Scratch Repairs – Deep Scratches. Deep scratches, especially those that break through the clear coat of the car will require more work to fix. These scratches may result from key scratches (vandalism), car park damage and general wear and tear. In most cases we will repaint (respray) the area. Bumper Scratches. 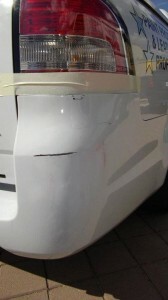 Bumper scratches – including painted and plastic bumpers. Headlight Scratches. Damage to headlight lenses. Wheel Scratches. Kerb damage to alloy wheels (also called ‘kerb rash’). Unlike body shop repairs, mobile repairs using SMART brings the cost down. Our low pressure paint spray guns and purpose-developed technique means we can complete scratch repairs from our mobile vehicle in a matter of hours. This allows us to charge small fees for jobs that might otherwise cost thousands. How much does it cost? To give you an idea, our mobile scratch repair Perth services generally range from $159/visit and up to $600 for scratches on multiple areas. From time to time we complete larger (multi-day) jobs which may cost more. When compared with panel shop prices, our scratch repair Perth service is great value for money. How do you get the paint colour right? Our mobile service vehicles are equipped with on-board computers. The computers are loaded with software that enables us to colour match the exact paint to your car’s make, model and year. Are the scratch repairs permanent? Yes, all repairs are permanent. Do you have a shop front? No. All our repairs are conducted at your home or work. From time to time we will pick up your car and drop it back – but this is usually for larger 1-2 day jobs. If you think you need a pickup/dropoff service, please ask. How long does it take? Superficial scratch repairs can take as little as 1 hour. Large scratches may take 2 hours and deep/long scratches can take 3-4 hours. The reason it takes so long is because we spend time preparing your car to create the perfect final result. We first mask up your car to protect the overall vehicle while we work. We then sand, smooth and polish to remove the damage before priming, painting, clear-coating and blending. It’s a many stage process that takes time to do well. Why are panel shops so expensive? Most panel shops do not use SMART for their repairs. This means they will often repaint an entire panel for a small-area problem. Unlike body shops, we focus only on the small area (usually less than the size of an A4 sheet of paper) and we use specialised techniques to get a great result in a much shorter timeframe. Informative post! Deeper scratches can create a more problematic situation. In addition, scratches that are exposed to the elements for too long will begin to rust – and this is where hefty repair bills can come into play. With this mind, it’s always best to try to catch and resolve the problem as quickly as possible. The longer a scratch goes untreated, the worse the situation is likely to get. If the primer coat is exposed, the damaged area can begin to corrode very quickly.